The solutions are here. They have always been here. Food does Matter! 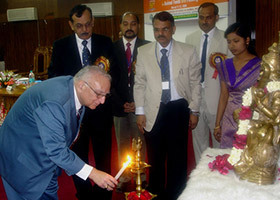 The Animal Nutrition Association (ANA) made its modest beginning in the year 1993 at the Indian Veterinary Research Institute (IVRI), Izatnagar, as Animal Nutrition Club with the objective of maintaining a liaison among the alumni, scientists and other professionals associated with Division of Animal Nutrition, IVRI. 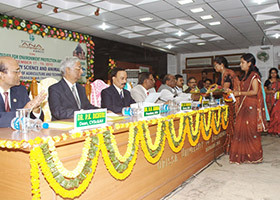 Based on the encouraging response and proposition received from the members across the country, it was decided to make the Animal Nutrition Club more broad-based, and accordingly it was renamed as Animal Nutrition Association, got registered with the Registrar of Societies in 1994, and made it open to all the persons involved in the field of animal nutrition and allied sciences. 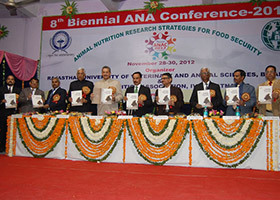 Since then, ANA has grown in leaps and bounds and build up as a professional forum at the national level. The ANA has now become one of the member organizations of World Association of Animal Production (WAAP), Rome. 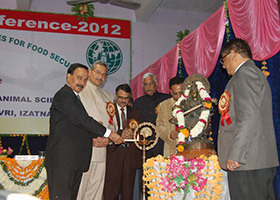 It now boasts of having more than 800 life members across India and beyond. ANA maintains this site for your information, education, and communication. Please feel free to browse the Site. Your access and use of the Site is also subject to the following terms and conditions ("Terms and Conditions") and all applicable laws. By accessing and browsing the Site, you accept, without limitation or qualification, the Terms and Conditions of Use below. Information (content, images, specifications and prices wherever listed) are subject to change without prior notice. You should assume that all material / information on the Site is protected by copyright unless otherwise noted and may not be used except as permitted in these Terms and Conditions or in the text on this Site. Although care has been taken to ensure the accuracy of the contents of this Site, ANA makes no warranties or representations as to its accuracy and ANA specifically disclaims any liability or responsibility for any errors or omissions in the content on the Site. Neither ANA nor any other party involved in creating, producing, or delivering the Site is liable for any direct, incidental, consequential, indirect, or punitive damages arising out of you access to, or use of, or inability to use or access, the Site. Without limiting the foregoing, everything on this Site is provided to you "AS IS" WITHOUT WARRANTY OF ANY KIND, EITHER EXPRESSED OR IMPLIED, INCLUDING, BUT NOT LIMITED TO, THE IMPLIED WARRANTIES OF MERCHANTABILITY, FITNESS FOR A PARTICULAR PURPOSE, OR NON-INFRINGEMENT. Please note that ANA assumes no responsibility, and shall not be liable for, any damages to, or viruses that may infect, your Computer equipment or other property on account of your access to, use of, or browsing in the Site or your downloading of any material, data, text, images, video or audio from the Site. The material / information provided on the Site is either the property of, or used with permission by, ANA. Unless otherwise specified by these terms and conditions or specific permission provided elsewhere on this Site, the Site is for your personal and non-commercial use. You may not distribute, exchange, modify, sell or transmit anything you copy from this Site, including but not limited to any text, images, audio and video, for any business, commercial or public purpose. As long as you comply with the Terms and Conditions of Use, ANA grants you a non-exclusive, non-transferable, limited right to enter, display and use this Site. Any unauthorized use of the content including images, video, animations, may violate copyright laws, trademark laws, the laws of privacy and publicity, and civil and criminal statutes. The Site may provide links to other Web Sites, which are not under control of ANA and it shall not be responsible in any way for the contents of any such web Sites linked to or from its Site. Any inclusion of such links shall not imply / interpreted as an endorsement of the owner / sponsor of the site or the content of the site. ANA disclaims all warranties, express and implied as to accuracy, validity, and legality or otherwise of any materials or information contained on such sites. The Trademarks, logos and service marks (collectively the "Trademarks") are the trademarks of ANA and / or its affiliates. Any other trademarks used in the Site are trademarks of their respective owners. Nothing contained on the Site should be construed as granting, by implication, or otherwise, any license or right of use any Trademark displayed on the Site without written permission of ANA. We may periodically send promotional emails about new products, special offers or other information which we think you may find interesting using the email address	which you have provided. From time to time, we may also use your information to contact you for market research purposes. We may contact you by email, phone, or mail. We may use the information to customise the website according to your interests. If you believe that any information we are holding on you is incorrect or incomplete, please write or email us as soon as possible, at the above mentioned address. We will promptly correct any information found to be incorrect.